Posted February 14th, 2005 by Ms. Jen & filed under news + events. What started out as a scratchy voice last monday after a weekend at the Pala Casino for my Grandma’s 85th birthday, has turned into a full fledged case of laryngitis and a dry cough if I try to talk. Other than no voice and an occasional dry cough cough, I feel fine. Bleh. Some days I sound like a little frog and today is the toad voice day. Croak. Bleh. Posted February 11th, 2005 by Ms. Jen & filed under photos + text from the road. Sun. 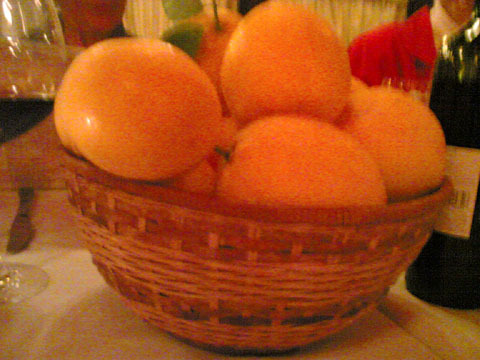 Feb. 6, 2005 – My cousin Lynn brought a basket of freshly picked Meyer Lemons from her garden to my Grandma Grace’s 85th birthday dinner. My mom immediately sliced open one of the lemons and squeezed it on her calamari. 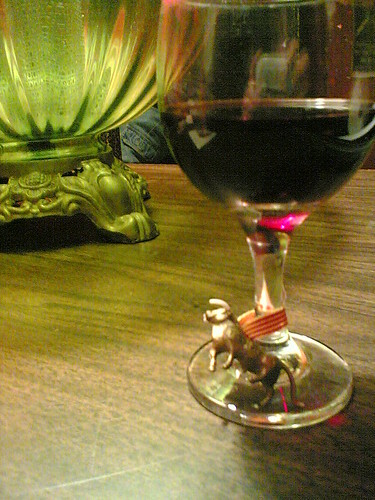 Posted February 10th, 2005 by Ms. Jen & filed under photos + text from the road. Thurs 02.10.05 – Sangre de Toro’s 50th anniversary for the 2003 vintage has a gold plastic bull attached to the bottle rather than a black one. Posted February 5th, 2005 by Ms. Jen & filed under photos + text from the road. 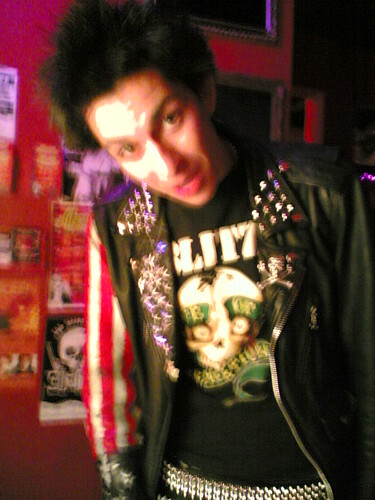 Fri 02.04.05 – Karl Irish = Terrorist Threat… Or so says the San Diego Police Dept as they shutdown tonight’s all ages punk show at 7pm because the show’s flyer was considered a terrorist threat. Ridiculous! 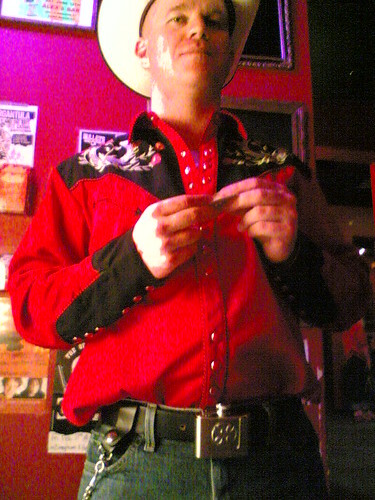 Karl Irish, the man who wears a flask belt full of 151 and a cowboy hat, a threat? Republican San Diego is insane. Need I say more? Posted February 4th, 2005 by Ms. Jen & filed under photos + text from the road. 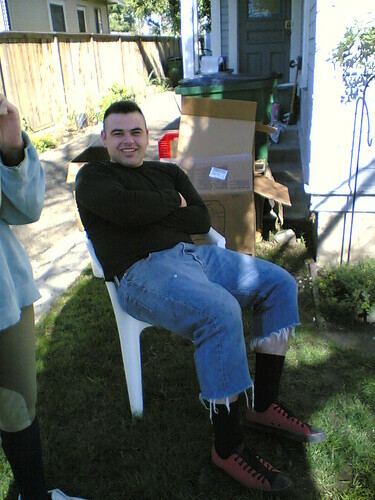 Fri 02.04.05 – Diego says he will be # 1 at Bowling this year. 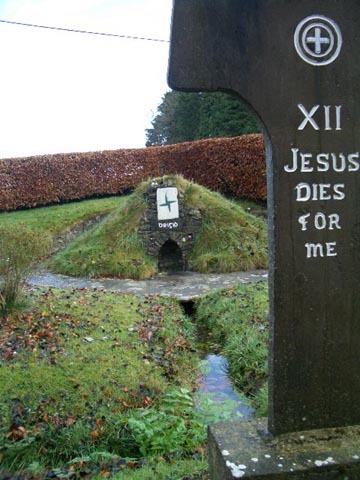 Happy Groundhog’s Day or Imbolc or Candlemas or St. Brigit’s Day! Keep Warm! Posted February 2nd, 2005 by Ms. Jen & filed under fun stuff. The Romans learned of this tradition from the Celts, and eventually brought them to the area that became Germany. German immigrants brought these beliefs to Pennsylvania, and the tradition of predicting the weather became centered on the woodchuck, or groundhog. Today marks Candlemas, the Festival of Lights, the Midwinter Festival. Known to Neopagans and ancient Celts as Imbolc (Gaelic origin, “in milk), a festival of the Maiden Goddess and a traditional time to bless agricultaral implements (especoially the Plough) and livestock. In Ireland, the day is the festival of St. Bridget, a holdover from celebrations oif the Celtic Goddess Brigid. Traditional “corn dollies” and “Bridget’s crosses” are fashioned from straw. Today, February 2nd, is also my father, Campbell Hanen’s birthday. Happy Birthday, Cam! I have loved Groundhog’s Day for a number of years, as it is whimsical and bordering on downright silly. I like under-appreciated holidays that don’t have the full weight of 8 weeks of marketing blitz behind it. More from About.com’s Landscape guy on the Origins of Groundhog’s Day. Posted February 2nd, 2005 by Ms. Jen & filed under photos + text from the road. Sun. 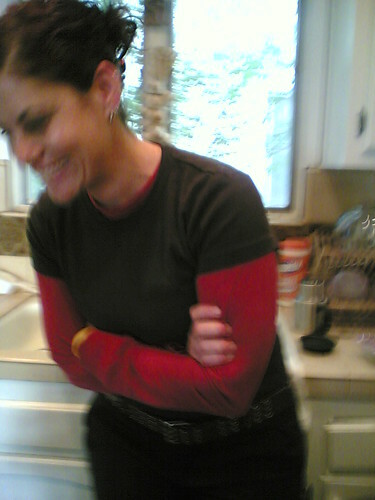 01.30.05 – Nancy laughing in Joanna’s mom’s kitchen after Kristen’s Baby Shower. Posted February 1st, 2005 by Ms. Jen & filed under photos + text from the road. Sun. 01.30.05 – I always admire Matt’s shoe and sock combos. He told me that he has a whole box of fun shoes. What a man!